German States stamps, prior to the German Unification, were issued by the individual Germanic states or free cities. The stamps for the former British Protectorate of Heligoland (German: Helgoland) are also included in this category. The Kingdom of Bavaria became the first state to issue postage stamps in 1849, and the Kingdom Saxony became the second state to issue postage stamps in 1850. The other stamp issuing German states of this time period were as follows. The House of Thurn and Taxis, while not a state, transported mail, and in 1852, they also began issuing their own postage stamps. The House of Thurn and Taxis had existed, as a postal service for the European kingdoms, since 1497, when the Holy Roman Emperor, Maximilian I, commissioned Franz von Taxis to establish a postal service to carry official mail. 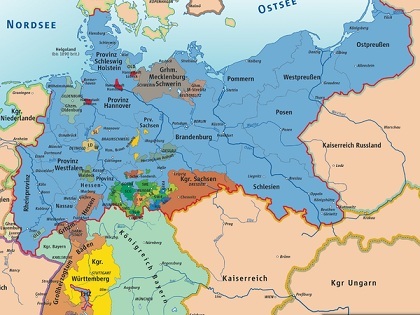 When the northern German states joined in the North German Confederation in 1868, they discontinued their own postal services and became part of the "North German Postal District", or "Norddeutscher Postbezirk". After the German unification and the establishment of the German Empire in 1871, imperial postage stamps were issued for use in all but two of the former German states. Bavaria and Württemberg retained their postal systems after the German unification. Bavaria continued to issue postage and official stamps until 1920, and Württemberg continued to issue official stamps until 1923. In order to provide my site visitors with excellent affiliated seller material and non-Scott-listed varieties, I have added links to the Germany eBay site to most of the link pages at the right. Remember, when visiting the Germany site .... the prices are in EUROS, shipping may be a bit more expensive, and international orders may take longer to arrive. When viewing the lots, make sure "Versand nach Weltwiet" (ships worldwide) is specified in the sellers shipping information. A few German sellers only ship to clients in Germany or in the European Union. The stamps of some of the smaller German states are scarce to rare, and in most cases, they are very high priced. With the expensive stamps and varieties, do not buy anything that isn't authenticated. German lot description / title keywords to look for are -- BPP Gepruft (back of stamp signed or stamped by a BPP expert), Attest (the German abbreviation for the word meaning certificate of authenticity), Falsch (Fake or Forged), and ND or Neudruck (Reprint).